In the mid-80s, I started reading quite a bit of spy novels set during the Cold War. The detente between Russia and the United States echoed in much of the literature of the time, from the stories of Ian Fleming‘s James Bond to the novels of Robert Ludlum, Ira Levin, Frederick Forsyth, and Ken Follett. Depending on where you turned, the Nazi legacy lived on around the world. So when I saw the description of The Thyssen Affair by Mozelle Richardson, I was excited. Here was a story that brought together remnants of the WWII OSS, its successor agency the CIA, the Israeli Mossad, the Russian KGB, and echoes of Nazi Germany. Plus, it stars Canyon Elliot, a Colorado rancher and retired intelligence officer as the main character. How could I pass it up? The story begins with Elliot being brought in on a CIA operation by a friend of his – Peter Landis. Peter, currently working at the CIA, was a good friend of his son before he was killed in Vietnam. Peter’s request is simple – take a skull to Munich, Germany, and figure out why the KGB went to the trouble to dig it up from a graveyard on the site of an old POW camp in Fort Reno, Oklahoma. Simple enough, right? The Thyssen Affair starts quickly and doesn’t let up to the end. And if you like your spy fiction with explosions, gunfire, and knife fights you shouldn’t be disappointed. It’s a chess game between Elliot and the people trying to keep him from the truth but when the lovely KGB agent Anya comes into the picture, she does more than ruffle his feathers as the two leapfrog around Europe. Richardson’s style reminded me quite a bit of the Ludlum novels I read as a teenager. It’s a quick read with intricate twists and turns, but like with Ludlum, the conspiracies and intrigue are nothing without great characters. Ultimately it’s those characters and the way their backgrounds bubble up to explain their motivations that really made this story work. Sure there’s a great deal of spy vs. spy action as well, but the character details are the glue that holds everything together. The other aspect of her style I absolutely loved is that this is set in 1980. There are no computers, no cellular phones, no James Bond Q-Branch gadgetry… Elliot and the rest of the gang have to rely on tried and true spy methods. Codebook stuffed in a hollowed out heel of a shoe? Check. Microdot copy of a map to Nazi treasure? Check. Standard hand to hand, knives, and guns? Check. And in most cases, Elliot is forced to use is brains to think his way out of problems more often than not. As I read along, I couldn’t help but think the book would make a great movie in the style of the James Bond films of the 1960s and 1970s. I’m not sure who they’d get to play Elliot, but perhaps someone like Tommy Lee Jones could pull it off. 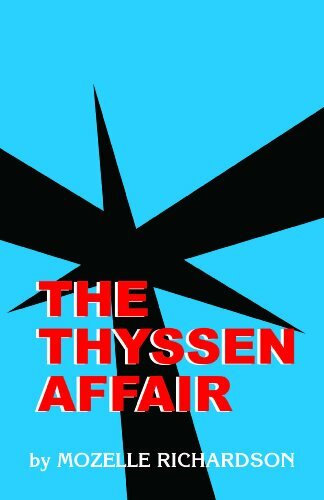 The Thyssen Affair was a fast, enjoyable read. If you’re looking for a good spy novel from the Cold War, be sure to check it out! This review first appeared at BlogCritics.org here. p.s. Pick up this book and other Cold War spy novels from Barnes & Noble below! Wow… Season 4 already? Time flies when you’re following the exploits of a burned spy and his friends and family in Miami. For those of you who aren’t familiar with the saga of Michael Westen (Jeffrey Donovan), here’s a quick summary of this awesome series on the USA Network. Michael is a burned spy, meaning he is no longer trusted by his handlers and dumped in Miami with no resources until they figure out what to do with him. In Miami, Michael reconnected with his old girlfriend (and ex-IRA operative) Fiona Glenanne (Gabrielle Anwar) and a semi-retired FBI agent Sam Axe (Bruce Campbell). Together the trio try to help clients get out of their trouble so Michael can investigate who burned him and possibly get back into the good graces of his former employer. In addition, you meet Madeline Westen (Sharon Gless), Michael’s chain smoking worry wort retiree mother. And occasionally we see his brother Nate (Seth Peterson) show up on the scene with some new get rich scheme or asking for help getting out of trouble. Over the first three seasons, Michael had been courted by an organization simply known as “Management” who want to use his skills for themselves. They somehow engineered Michael’s “burn notice” in order to get him into a position to recruit him. Michael isn’t fond of Management to say the least and managed to cut them loose back at the end of Season 2 even though that decision caused a few issues of its own. In Season 3, in order to stop an insane plan by Mason Gilroy (Chris Vance), Michael gets close to Gilroy and professes to “help” him with a grand plan. That grand plan turned out to be releasing insane former agent Simon (Garret Dillahunt) whose horrific exploits Michael was framed for, thus causing his burn notice. At the end of Season 3, after Gilroy met an untimely end, Michael reluctantly contacted “Management” and worked with them to stop Simon before too many innocent people died. And in the season finale, after stopping Simon, both he and Simon were taken into custody. In the very last scene, Michael is moved somewhere and put into a chair. When his hood is removed so he can see, he finds himself in a nicely appointed office wondering what he was doing there and who he’d encounter. Can Michael work with Vaughn long enough to get to the bottom of whatever evil scheme Management is working to help or hinder? Only time will tell. But once Michael returns to Miami, he’s thrust into the middle of a little situation that Fiona and Sam managed to cook up while he was gone. Somehow lawyer Winston (Rich Sommer) managed to help a woman divorce a member of a biker gang and get her to safety. The biker gang didn’t like that much and has put a price on Winston’s head. And once you’ve annoyed one member of a biker gang, it’s likely you’ve miffed them all. So Michael has to help Sam and Fiona clear up that mess and help Vaughn get some information he needs. Looks like Season 4 of Burn Notice will be full of some interesting twists and turns for Michael and the gang. I’m happy that Management is back in the picture again. Though evil, they always seem to present some unique moral quandaries for Michael to navigate. Be sure to tune in on the USA Network tonight – Thursday, June 3 at 9/8 Central – for the season premiere. I can’t wait to see what creator Matt Nix and his awesome cast have in store for us this time! It’s called Covert Affairs, starring Piper Perabo as new CIA agent Annie Walker and Christopher Gorham as blind tech-ops expert Auggie Anderson. New jobs are tough- especially when your new employer is the CIA. Annie Walker (Piper Perabo) is fluent in six languages, has traveled all over the world and is besting her fellow CIA trainees in every test, but that doesn’t explain why she’s suddenly summoned by CIA headquarters to report for active duty as a field operative a month before her training is over. What she doesn’t know is there may be something-or someone-from her past that her CIA bosses are really after. With the help of Auggie Anderson (Christopher Gorham), a tech ops expert who was blinded while on assignment and is Annie’s unofficial guide to this inscrutable world filled with intrigue, danger, and bureaucratic red tape, this quick study won’t be kept in the dark for long. Looks interesting! I’m sure we’ll be checking it out come summertime!